Cosmetic service is becoming more and more popular all around the world. it mainly located in a shopping mall or own store. for selling skincare, cosmetics, and body care product service. 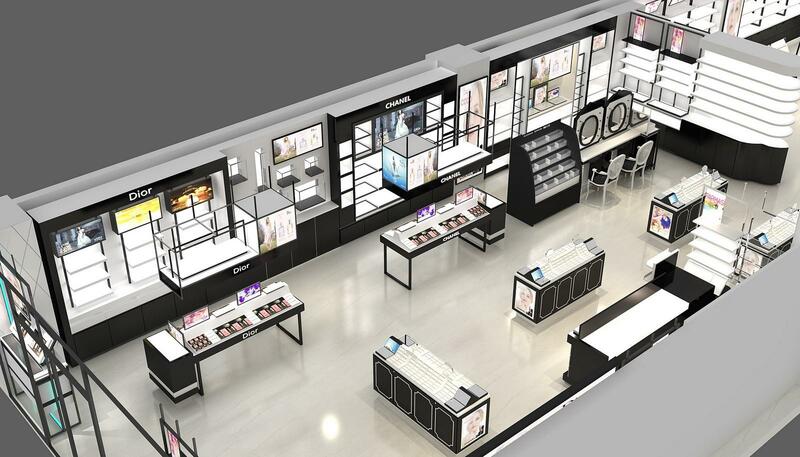 In this article what I wanna share is very modern and exquisite cosmetic shop design with retail display fixtures for sale, if you are interested to start your own cosmetic store, it’s very necessary to see more details below. 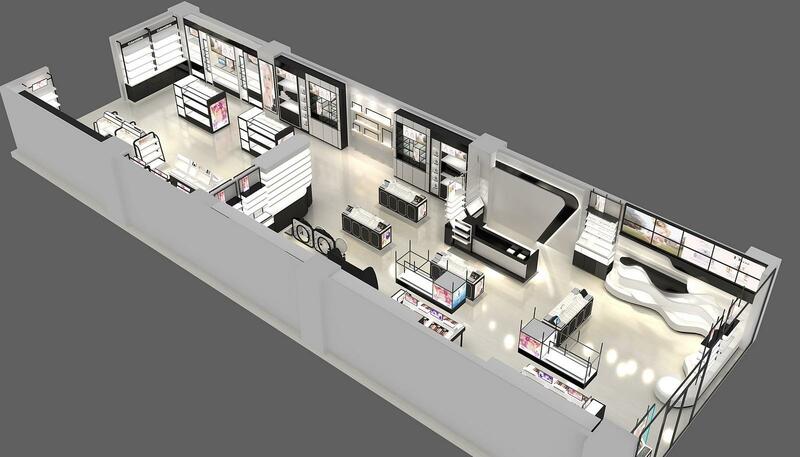 Let’s see more details about this cosmetic store together. You can see the whole shop is very big and modern. The total is about 150sqm, mainly tone is white and black.the front part of the shop is a glass window, the next to is a white counter for showcase display. guest can directly see the shop interior furniture and decoration. 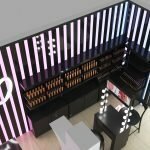 When we into this store, the first we can see is some make-up display stand, its double sides display with mirror.at the left is some double sides cosmetics display table, match some lightbox showings. the right sides is a white reception counter. On both sides of the whole store, we are equipped with some high wall laminates for display. match led light, decoration strip. Lightbox. looks very nice. Size: 150sqm. or customized based on your store. Color: white and black or others. Service: cosmetics. skin care product, body care product. How can I customize a cosmetic shop like this one? 2. Rent a store or a lease in a shopping mall, but need sure the location environment, Bustling, with enough people flow. If you have your own storefront, then you can decide all the details on your own. On the contrary, if it is used in the shopping mall, it must meet the criteria of the shopping mall, ( usually mall criteria mainly for material, height, and electrical wire safety, if your design team enough professional and experience, it’s Easy to approve）. 3. Find a direct supplier make a 3d design and drawings. — as a direct supplier, before deciding we will confirm the shop layout, style, color match, material request, etc . also can give you some professional advice. then we will start design and put all of your ideas on it. confirmed the design and start making drawings. ( you can see all details here, with each part size material and surface finished details, will according to the drawings production ) . 4. Install the whole shop and start operating, You can hire several people to help you if the shop enough big. 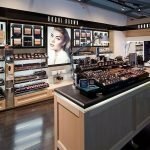 Thanks for your time and reading, unique kiosk as a direct manufacturer, we mainly work on the design and customized different types of retail cosmetic store and cosmetic display fixtures. if you’re interested to start a cosmetic store like this one. or check more different types of choice can via our cosmetic store fixtures page. welcome inquiry.